"This has long been my go-to recipe for Easter brunch, potluck lunches, bridal and baby showers, or really, anytime we want a delicious chicken salad. It can be made a day ahead. The unique combination of the fresh ginger and green grapes always draw raves. I serve mine with a basket of fresh croissants that my guests can then make into chicken salad sandwiches, if they choose. There are never any leftovers!" 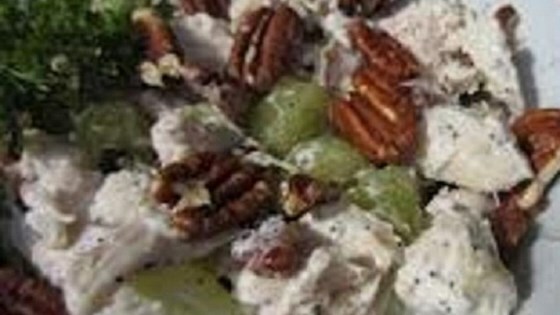 Combine chicken, grapes, celery, pecans, and parsley in a bowl. Whisk mayonnaise, sour cream, ginger, and white pepper together in a separate bowl; gently stir into chicken mixture. Cover bowl with plastic wrap and refrigerate until chilled, 1 to 2 hours. Plain Greek yogurt can be substituted for the sour cream.